DANA POINT — Proposals to ban antifouling boat paints containing copper — a hot topic in Southern California for the past few years — were discussed at the Recreational Boaters of California (RBOC) Southern California Boaters’ Forum, Feb. 29 in Dana Point. While the forum mainly focused on the potential elimination of the California Department of Boating and Waterways, the boating advocacy group opened the night’s discussion with a presentation from RBOC president Cleve Hardaker regarding the current status of legislation introduced by California Sen. Christine Kehoe last year to ban certain types of hull paint with copper content: Senate Bill 623. The bill, introduced in February 2011, would limit and eventually ban the use of copper in antifouling hull paints statewide. The ban would be implemented by initially prohibiting the sale and manufacture of copper paints, followed by the banning of copper bottom paint application on boats. “That problem started in San Diego, in Shelter Island Yacht Basin, where my boat is,” said Hardaker, who is a Silver Gate Yacht Club member. Studies have shown that Shelter Island Basin, along with multiple harbors along California’s coast, have elevated levels of dissolved copper in them, which some studies have said could harm marine life in the area. The San Diego Regional Water Quality Control Board cited a study finding that 95 percent of the copper in Shelter Island Basin is directly attributable to copper leaching from boat hull paints. That pronouncement led the board to take action, initiating a Total Maximum Daily Load (TMDL) limit for the allowable amount of copper in the basin that would not harm marine life. “The problem is that while high levels of copper in the water are associated with marinas and are associated with antifouling paints that boaters use, the antifouling paints in question are currently legally registered pesticides — and they are licensed and available to anybody in California,” Hardaker said. “The position that RBOC has taken is that there really isn’t a good alternative available for copper-based paints yet,” Hardaker said. However, the Port of San Diego has elected to comply with the regional water board’s mandated TMDL — and it has started taking action to steer boaters toward using other types of bottom coatings that do not contain copper. Even with the TMDL in place and the Port of San Diego offering funding assistance to boaters who apply non-copper paint alternatives, Shelter Island boaters have continued to use copper-based paints — and that situation led to the development of Sen. Kehoe’s bill. 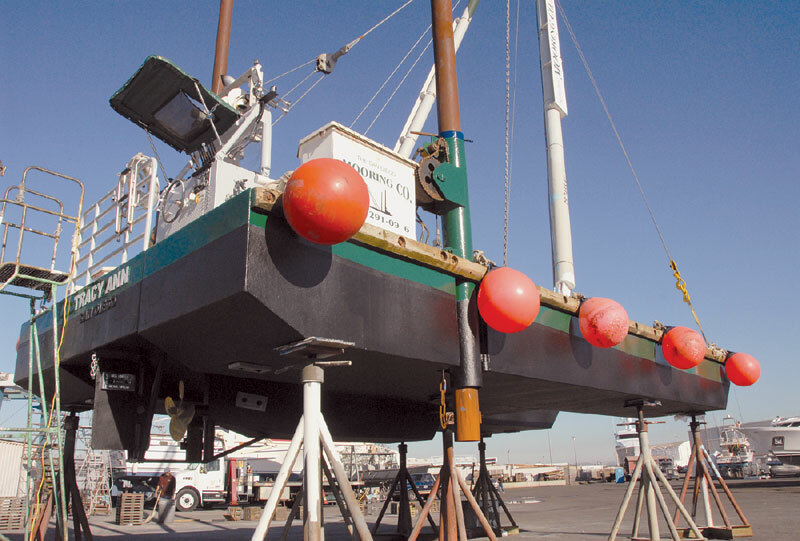 With consideration of the bill still pending, Hardaker questioned why a bill was written that would require boats all over the state to change their bottom paint, to address a problem associated with only certain harbors. “Admittedly, the argument is made that there is excess copper in a lot of the harbors in Southern California, but there is no copper problem whatsoever in San Francisco Bay,” Hardaker said. He pointed out that while a TMDL was listed for San Francisco 15 years ago, more recent studies showed that while there were elevated levels of copper in the water, the copper was not toxic. As a result of the study, all of San Francisco Bay — minus a small harbor in North Oakland — was delisted from the regional water board’s impaired water bodies list and is clear of restrictions or limits regarding copper. “But, if Senate Bill 623 goes through, and eventually ends up banning copper paint, all of the boaters in San Francisco are going to be deprived of using copper-based paints that work quite well for a body of water that doesn’t have a problem with copper,” Hardaker said. In addition, Hardaker noted that another study was done in Shelter Island last year that showed similar results to those in San Francisco: While there were elevated levels of copper, they weren’t shown to be harming marine animals. RBOC has stated that it will remain opposed to SB 623 until an alternative paint is developed that is effective, affordable and available to boaters. Also present at the RBOC Boater’s Forum was Deanna Spehn, policy director for Sen. Kehoe, who is working on a revised edition of SB 623 that is planned to be submitted later this year. “We’re working with RBOC, we’re working with paint manufacturers and with people who are looking at water quality throughout the state, to come up with something that gives enough time for paint manufacturers to come up with a reasonable alternative that does not affect the environment the way the copper does, and allows the improvement of water quality in the bays,” Spehn said. She added that the state’s nine regional water quality control boards all have the capability of developing their own enforcement and requirements for bottom paints and TMDLs, which could create confusion for boaters going from region to region, dealing with constantly changing regulations. “By doing legislation that covers the entire state with one set of rules, the paint manufacturers and people who have boats in the water will then be able to accommodate to what the single piece of legislation requires, rather than nine separate sets of rules,” Spehn said. But some believe the bill’s future remains uncertain, as its implementation would require additional testing by the state’s regional water boards and by the Department of Pesticide Regulations — agencies that are facing budget cuts in Gov. Jerry Brown’s 2012-2013 budget proposal. According to RBOC representatives, the bill would impose an estimated average new cost of $5,000 every other year on an estimated 200,000 boaters who use antifouling paints to protect their boats, for a total mandated expense of at least $1 billion every two years. Action on the bill is not expected until summer.